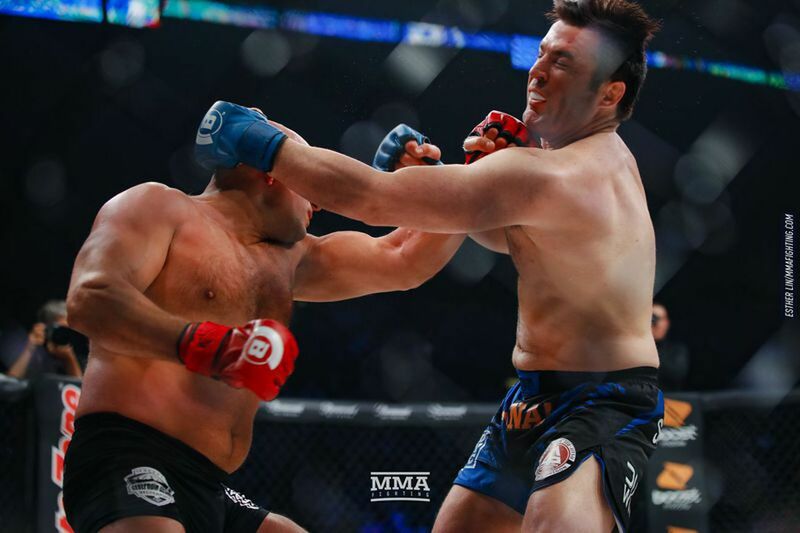 Bellator 208 ended on an entertaining note with a gutsy fight from Chael Sonnen against Fedor Emelianenko (watch the highlights here). Few gave the middleweight much of a chance against the heavyweight GOAT, but Sonnen dug deep and kept getting back to his feet and chasing more takedowns after multiple knockdowns and throws. That aggressive momentum created some unique looking scrambles and breaks, which led to some MMA ‘fans’ on social media to question whether the fight was faked. There was enough rumbling that the press actually asked Bellator head Scott Coker about it during the post-fight press conference. Chael himself was happy to confirm that statement. There were several moments in the fight where Chael seemed close to defeat, but each time he managed to regain position or stand back up. Well, until the final moments of the first round, anyway. As Fedor hit him with withering ground and pound, Sonnen covered up and the ref stopped the fight. According to Chael, that was strategy gone awry. Emelianenko now moves on to the finals of the Bellator Heavyweight Grand Prix, where he’ll face light heavyweight champ Ryan Bader on January 26th in Inglewood, California. As for Chael, maybe he’ll return to 185 pounds, but more likely we imagine he’ll remain a Bellator moneyweight, fighting across three divisions against any opponent that catches his fancy. Not a bad way to close out your career. Oh, hey, there was a Bellator last night – Bellator 205 to be exact – and guess who was on it? Roger Huerta. Maybe you remember Huerta from his ultra-brief run as a UFC superstar, which saw him grace the cover of Sports Illustrated (back when that was unheard of and really cool) and then disappear like serial killer in the Northwest because he wanted more than his UFC contract would give him. The intervening years have not been kind to Huerta, and though he beat up a bigger bully outside a bar and the vid went viral, and he set up shop at a gym in Southeast Asia, he hasn’t been able to muster much momentum for a triumphant comeback in Bellator’s cage. Anyway, Patricky “Pitbull” Freire had the honor of facing the former start, and while Huerta put up a heck a fight, banging away with the dangerous heavy-handed jiu-jitsu black belt… yeah, this one ended ugly. On the plus side, after that knockout, Huerta probably doesn’t remember the fight at all. In fact, he might not remember any of his Bellator fights. Elsewhere on the card, jiu-jitsu dude Rafael Lovato Jr. persevered with his relentless grappling and eventually caught John Salter in a choke. Lovato Jr. remains undefeated, but he’s a middleweight in Bellator, so no one will ever know his name. In the main event, AJ McKee – son of the great Antonio McKee – also kept his undefeated record by knocking out John Teixeira. Again, a Bellator fighter, big fish in a small pond, the world will never know him. The post Bellator 205 Results: Making Sure the Ghost of Roger Huerta Stays Dead appeared first on Caged Insider. In the first episode of UFC 208 Embedded, Anderson Silva trains, Holly Holm gets work in at JacksonWink MMA, Germaine de Randamie does interviews for the Dutch press, and Derek Brunson takes his daughter to a beauty pageant. The UFC had to scramble back in July when Jones’ failed drug test threw its blockbuster UFC 200 card into disarray just days out from the bicentennial event. Left without many options, a women’s bantamweight title bout between Amanda Nunes and Miesha Tate ended up headlining UFC 200, while Anderson Silva was tabbed to fight Jones’ initial opponent, Daniel Cormier, at the eleventh hour on the event’s pay-per-view card. The situation was just the latest example of Jones’ outside-the-cage indiscretions getting in the way of a fighter who may very well be one of the greatest to ever live. But when asked about White’s promise to never headline Jones again, the troubled light heavyweight dismissed the idea on Twitter. Jones, 29, is suspended until July 2017 after arbitrators determined that he did not do his due diligence in researching the sexual-performance pill that led to Jones testing positive for two banned substances, the anti-estrogen agents clomiphene and Letrozol, in an out-of-competition drug test prior to UFC 200. The Nevada Athletic Commission are also expected to rule on the matter and could suspend Jones for an additional length of time. So while Jones may be out of the public eye for awhile, that didn’t stop him from weighing-in on a variety of current events in the same impromptu Twitter Q&A that led to his comments about White. Check out Jones’ thoughts on McGregor-Alvarez, his return, Michael Bisping’s reign as champion, and more below. Conor McGregor was already sitting on top of the mixed martial arts (MMA) world before knocking out Eddie Alvarez in the main event of UFC 205 last weekend (Sat., Nov. 12, 2016) to claim the lightweight title; becoming the only man to hold two division titles simultaneously. But after making history, the avenues for “Notorious” to explore have widened, as Paul “Triple H” Levesque — VP of Talent at WWE — says if McGregor wants to make the jump over to that arena, it would be an easy transition for an athlete who seems to have the complete package. Triple H, who was in attendance at Madison Square Garden to witness Conor’s history-making moment, says the days when you had to be a massive and muscular athlete to make it in professional wrestling are long gone. And there wouldn’t be a shortage of athletes on the WWE roster who’d be anxious to get their hands on the Irishman, as he took the roster to task recently, calling them all “messed up pussies,” except for a select few, Levesque included. Of course, Conor won’t be stepping into the cage — or ring — anytime soon, as the multi-division champion is planning on taking a break from all combat sports as he welcomes the birth of his baby sometime next year. After that, he intends to have a pow-wow with the powers that be at UFC to talk about getting a piece of the company pie. That said, Conor won’t have a shortage of options to fill the void MMA will leave behind when the day comes he hangs up his gloves for good. In the meantime, it wouldn’t be too farfetched to see him make a cameo at an upcoming WWE event, just to see how it plays out and how well he’s received by the WWE universe. The promotion has lent its stars out before to the biggest wrestling organization on the planet, and if I remember correctly, Dana White might owe Vince McMahon a favor.